Newt Scamander heads to Paris to track down the fugitive Grindelwald. 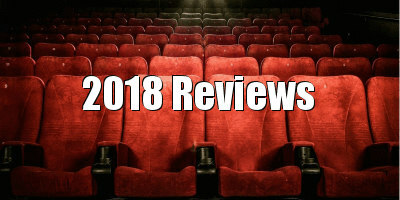 For better or worse (worse in this writer's eyes), the success of the Harry Potter franchise is largely responsible for the current Hollywood landscape of endless sequels, prequels and that awful phrase "universe building." The Potter films showed Hollywood that it was a far safer financial model to hook audiences into returning for instalments of an ongoing series rather than taking a punt on the unknown quantity of original properties. It was always inevitable that Hollywood would return to the world (or "universe") of Harry Potter in some fashion, and so we now find ourselves two episodes into a planned five movie franchise set in the playground of JK Rowling's creation. 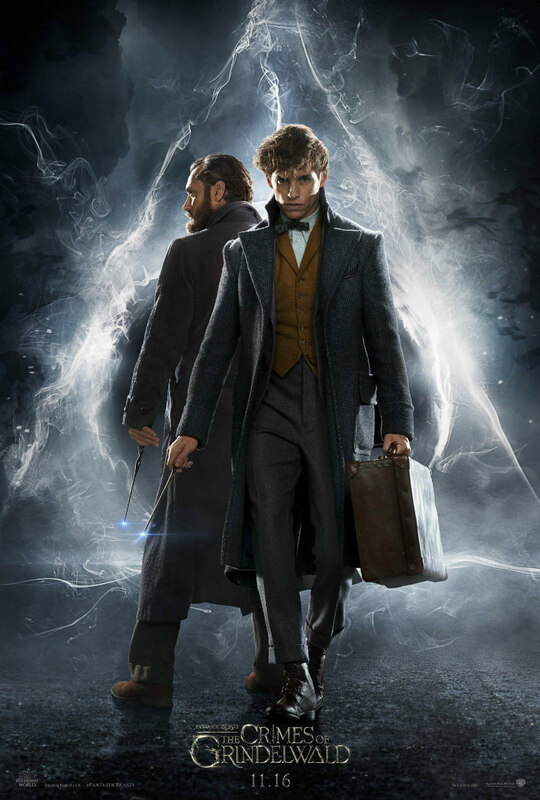 The first instalment of the Fantastic Beasts series, 2016's Fantastic Beasts and Where to Find Them didn't fully work - in its final act it descended into the sort of headache inducing CG battle the superhero genre is so often criticised for - but it boasted an endearing lead in Eddie Redmayne's Newt Scamander, and an equally charming cast of supporting characters. Scripting the film herself, Rowling did an admirable job of fleshing out the world that this new spinoff series would play out in, so there was certainly potential for a thrilling and engaging sequel. Sadly, The Crimes of Grindelwald is such a lazy, uninspired piece of franchise filmmaking, you could bury its DVD in a time capsule to represent the sorry state of blockbuster cinema in the early 21st century. 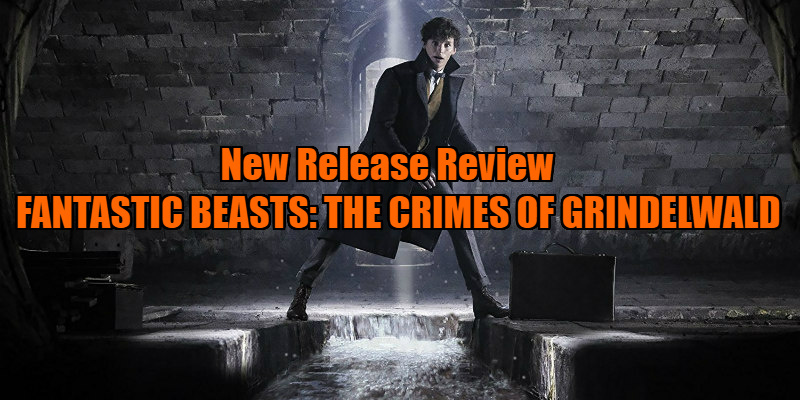 Following the precedent set by The Empire Strikes Back, this second instalment of the Fantastic Beasts saga is "the dark one," but it's "dark" in the manner of Zack Snyder's DC superhero movies, drained of the humour and colour that made the first movie a pleasant enough watch and filled with 'edgy' moments that are cheaply designed to shock, and which have no place in a franchise aimed at a family audience. At the end of the first movie, audiences sighed when Colin Farrell's villain was revealed to be Johnny Depp's Grindelwald, gifting Depp yet another opportunity to prance around in makeup and irritate those of us who grew tired of his attempts to escape his pretty boy image long ago. In this sequel, Grindlewald breaks free during the wizarding world's equivalent of a routine prison transfer (have they never seen a Halloween movie?) and sets up shop in Paris with a gang of brooding followers in tow. The plot that follows is needlessly convoluted but it basically involves Scamander heading to Paris to track down Grindelwald, in the process hoping to reunite with Katherine Waterston's Tina Goldstein, whom he has fallen madly in love with. If every movie in this series comes in at around the 135 minute mark, as the first two have, that's a grand total of over 11 hours running time. You would think then that, having used so much of the first instalment to set up the characters and their world, Rowling might use these middle chapters to let us get to know these people a bit - think of how much time we spend hanging out with Clark and Lois in Richard Donner's second Superman movie for example - but her script is so focussed on moving the plot forward that Scamander and his buddies are largely devoid of personality here. Aside from one fun scene involving the unlikely romance between Dan Fogler's Jakob Kowalski (who gave the first movie much of its charm) and Alison Sudol's Queenie Goldstein, and an awkward romantic moment between Newt and Tina (Newt's childlike demeanour makes this budding romance feel misjudged), FB:TCOG never takes a timeout from its focus on franchise building and filling in backstory that doesn't add a whole lot to the current narrative. There's one character - William Nadylam's Yusuf Kama - who exists solely to tell other characters, and the audience, some important plot details that Rowling couldn't find a more organic way of doling out, and the amount of exposition dished out in monologues makes a strong case for why novelists should keep away from screenwriting. As with the first film, the main strength of this sequel is its production design, rendering 1920s Paris in the same sumptuous fashion as the first one did with the New York of the era, and Colleen Atwood guarantees her obligatory annual Oscar nod with some striking costumes (if you appreciate a well cut waistcoat, this is pornographic). Yet while the first movie made you feel you were in 1920s New York (despite the bizarre absence of black faces), TCOG never quite does the same for Paris - French actors are largely absent and composer James Newton Howard fails to incorporate a Gallic element into his score in the manner in which he previously captured the rhythm of New York's Jazz Age. There are so many revelations about how characters are related to one another here that it can feel like you're watching a two hour supercut of six seasons of Dynasty, and only the most committed of Potterphiles will be impacted by such reveals. As with the first movie, the climax descends into the usual CG mess of blue flames and heroes screaming "Noooooo" as something bad happens to someone we stopped caring about an hour ago. Even the beasts aren't so fantastic here, and the generic digital creatures on display forced me to wonder what Jim Henson might have done with this concept back in the day. Two movies in and Rowling's new series has already lost its magic. Fantastic Beasts: The Crime of Grindelwald is in UK/ROI cinemas November 16th.